Rotomail Italia Invests in an HP T410 Color Inkjet Web Press to Increase Production, Reliability and FlexibilityRotomail Italia Spa, of Vignate (Milan), Italy, has installed an HP T410 CWP. The investment was made as part of its commitment to providing cutting-edge print-on-demand services, powered by the latest market leading technology. Rotomail chose HP as its preferred digital press partner in 2010 when the company installed an HP T300 Color Inkjet Web Press. The two digital inkjet web presses and the company's HP Indigo W7200 Digital Press now give Rotomail significant digital firepower for trans-promotional, direct mail and book production. "We chose the HP T410 Color Inkjet Web Press because our HP T300 has enabled us to achieve outstanding results on all fronts," explained Alessandro Antonuzzo, marketing manager, Rotomail Italia. "This new press is based on the same technology, but runs at a higher speed and offers a superior print quality. For print quality and productivity I maintain that the T410 Color Inkjet Web Press is the best press currently on the market." 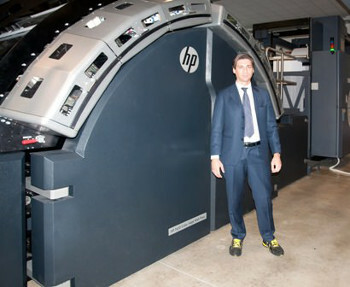 HP said that Rotomail was one of the first companies in the world to use full-colour inkjet print technology and is today considered one of the main European producers of digital colour print direct from electronic data. "We have been particularly impressed with the flexibility of the HP T-series presses," continued Antonuzzo. "They can be used for applications ranging from transactional print to the highest quality book production. We will use the new T410 Color Inkjet Web Press to print colour transactional communications for clients ranging from financial institutions to utilities companies. "With this press, a finishing line that we have patented, and a software modification that HP swiftly implemented to meet our requirements, we can print books of different formats from the same web of paper. We will be able to increase our presence in the publishing print-on-demand sector, printing covers on the HP Indigo W7200 Digital Press which enjoys the same functionality. This is a remarkable level of flexibility," Antonuzzo concluded. The HP T410 Color Inkjet Web Press can print 100 per cent variable data content at speeds up to 5,000 colour pages a minute and almost 7,000 mono pages a minute, with a scalable web width up to 1066.8mm. The press can print up to 140 million A4 format colour images a month at up to 183m/min (175 million in mono at 244m/min). HP T-series presses are equipped with new advanced technology inkjet print heads and with nanotechnology pigment inks capable of helping to achieve high speeds without compromising quality.